A card for the Technique Lover’s Challenge over at Splitcoast today. Judy was recently at a get together with some stamping buddies and learned this technique from Melissa Edwards. You can find all the info here at Splitcoast. The samples shown are all CAS designs. I took it a step further and matted it on black card stock. It’s a spin on the acrylic block technique. 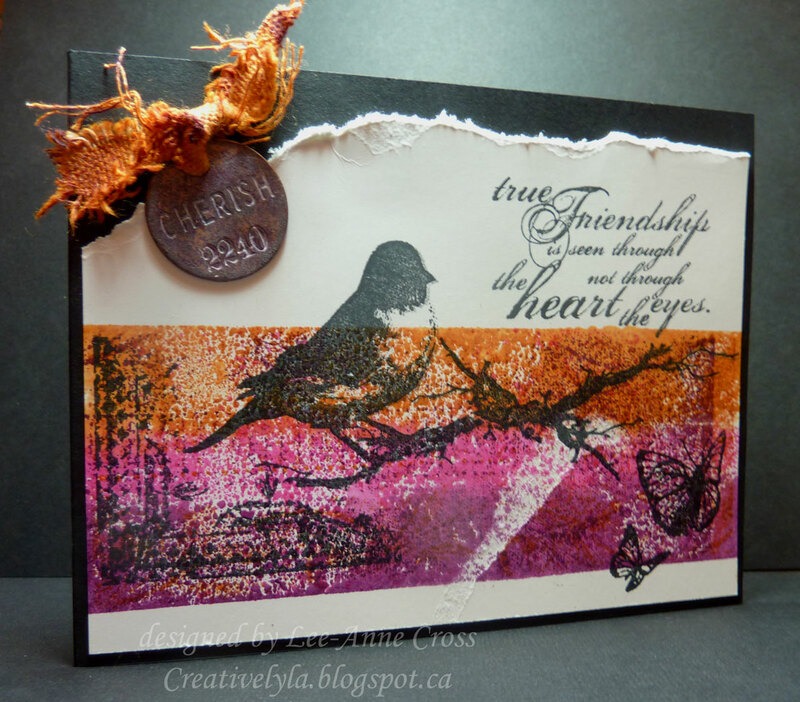 I’ve inked my acrylic block with three different shades of Distress Inks, then spritzed the block with water before stamping. Next, I masked off the rest of the card with Post It Notes, leaving the area just stamped. Taking the one of the same colors I stamped the area again. This added more texture just by stamping the darker color again. (You could repeat this with several colors.) Then, after I had removed the Post It Notes, I stamped some more images and the sentiment in black. There was a happy little accident… my Post It Note actually really stuck to the card stock and ripped off a section of paper. Instead of throwing it out, I used it…it adds more texture and interest. My only embellishment is a tag that’s been painted with Distress Paints and wiped dry. I also used a piece of canvas fringe which I dyed with two of the same Distress Inks I used in my acrylic block technique. The tag was glued on to the card with Ranger Glossy Accents. See you very soon with more my friends! Have a marvelous Monday! I am fascinated by that tag! It looks like old metal. Is it metal? Or chipboard? Love this card and the added dimension of making it a two-layer card instead of just one layer!